Week 3 of Merry Monday for me! Thanks so much for coming by and welcoming me. You ALL have been so terrific! silver ultra fine glitter paper. make and exchange card kits, and this is perfect for that. Quick, easy to make - and mass produce.. I really think the angle in the plaid makes the entire card bedazzled looking! Join us in the "Merriment"
That you will proudly and (very) happily deliver! 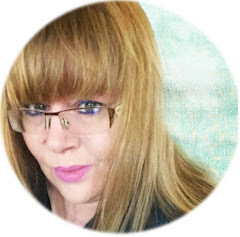 Featured Guest Designer -----Hey that is me - YAY! Another uber fantastic card!! Loving that sparkle on the deer. Beautiful! Hi Kimberly, it's been great working with you this month. I love how you used the DSP and added the sentiments and the jumping deer. Fantastic card! EEK! I love this. The sentiments are fab along with that amazing silver jumping deer! WOW!!! Fabulous CAS card Kimberly, I love the large sentiment and glittery deer. This is beautiful, the embossed sentiments on the pink paper is simply gorgeous, this card just glows :) so glad to be designing with u Kimberly ! love the colors and the subway stamp! Kimberly, your cards are as much fun as you are! Love this pink plaid and the big, embossed words! And that sparkly deer is awesome! This is really cute, and great use of the colors. 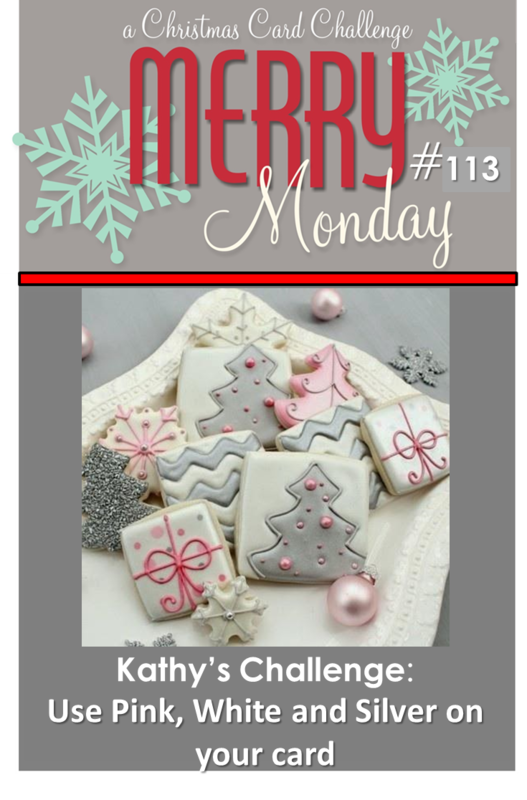 I have to try and make a Christmas card for this challenge because pink is my favorite color! 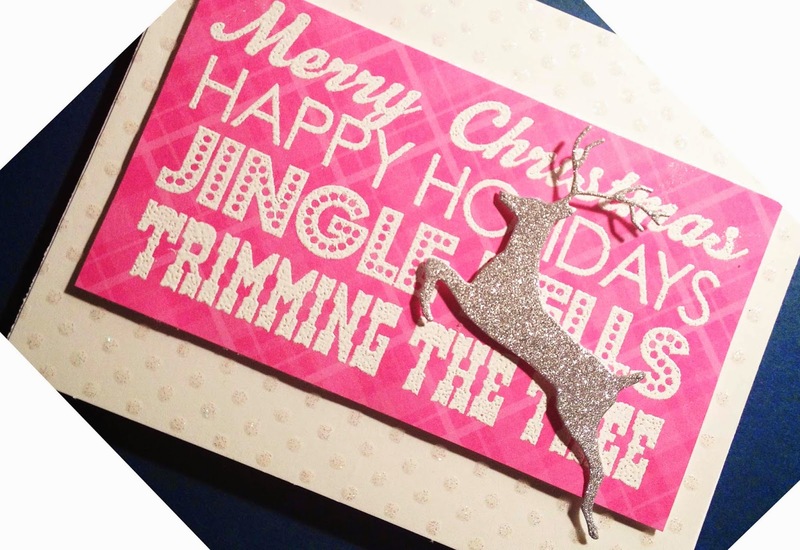 And I have to admit that I have never made a Christmas card before with PINK! smile. There's almost too much awesomeness to take in! Plaid pink? Glitter polka dots? Silver reindeer??? Brilliant! 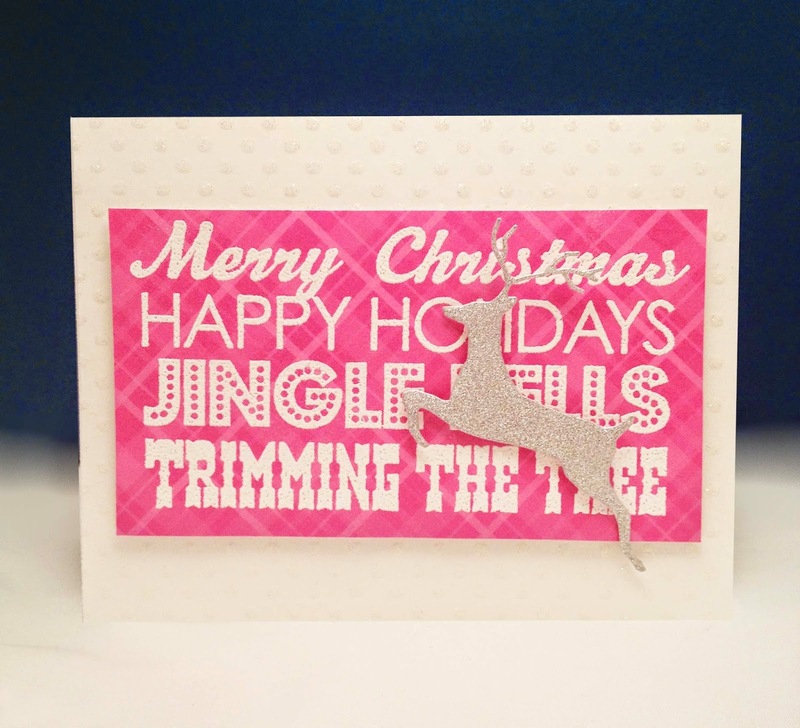 Love the sparkly reindeer and the bold, CAS design of this card! This is stunning! Love the glittery reindeer!! So happy to have you designing with us this month!! So bright and beautiful! I love your modern take on these colors. I LOVE all the fantastic glimmer on your card, and the bold text makes it so cool!